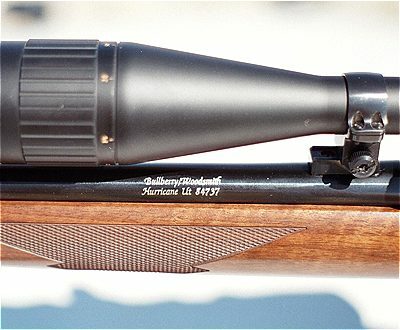 6mm BR Norma Gun of the Week -- A Select 6BR Rifle of interest to benchrest, precision and Varmint 6mm Shooters. With reloading info and free photos. You find 6BRs in a variety of action configurations. Here is Mike Delbo's handsome Ruger No. 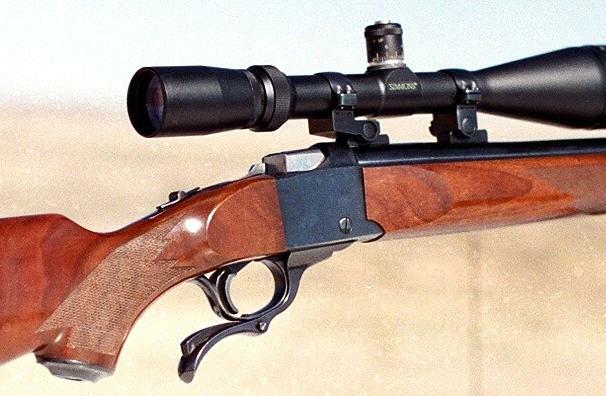 1-V chambered in 6mm BR Remington by Bullberry Barrel Works. It sports a 24" barrel and a Moyers trigger. Mike tells us "I have not had this rifle long, but for an old-fashioned No. 1 it sure shoots like a dream. This rifle, shooting 55-grain ballistic tips and 87-grain V-maxs, is a rockchuck's worst nightmare out to 600 yards. The rifle has 1 in 12" twist rifling and shoots very well with all the bullets and powders I have tried. Bullberry installed a forearm tension device to tune the barrel harmonics." Mike gave us this field report: "I really enjoy the change in shooting the falling block action after shooting mostly bolt actions. The absence of a bolt action type receiver makes for a quick-handling, shorter rifle. The balance point when shooting off-hand seems more natural with the falling block. Single shots are no handicap when shooting varmints as you will slightly slow your rate of fire in a hot dog town. I also think the Ruger No. 1 is a very handsome rifle design. The rifle performed very well last Saturday. I was shooting prairie dogs using a bi-pod and rear bag. I managed to keep my hit ratio at 75%. I was fire-forming Remington 7mmBR brass in the best possible manner (shooting prairie dogs). The spot I shoot has very few short range shots. The average shot is about 250 yards and you can shoot as far as your equipment will allow. Longest shot of the day was 480 yards. The 6mmBR sure pops a prairie dogs and hits harder than the 22 centerfires. The 6mmBR has a lot going for it. I am a varmint hunter and while it is not the fastest 6mm cartridge it is fast enough and very efficient. You can push a 55 grain ballistic tip 3800 fps. That is as fast or faster than a 22-250 shooting the same grain bullet and you have a higher ballistic coefficient. Where I think the BR really shines is when using 65-75 grain bullets. Good velocity, good wind cheating, low recoil, little powder use, easy on the barrel and inherently accurate. What more could a varmint hunter wish for?" 6mmBR.com asked Mike about the chambering. He replied "I called Bullberry in Hurricane, Utah and they told me it was cut for the Remington 6mm BR case (I purchased the rifle used at a gunshow last year). I have not made a cast of the chamber so I'm not sure of the exact dimensions. I've been using Remington 7mmBR brass (necked-down) with good success. I snapped these photos recently during a prarie-dog shoot in Wyoming. It was only the third time I have taken my rifle into the varmint fields and she did not let me down! It is the only falling block that I own and it is very short and handy even with the 24" barrel. The scope you see here has been replaced with a Leupold 6.5-20x50 30MM LRT side focus with Mil-Dot." Copyright © 2006 AccurateShooter.com | 6mmBR.com, All Rights Reserved. No reproduction without advance permission in writing. Mike DelboImages Copyright © 2004 Mike Delbo, All Rights Reserved. Used by Permission. Topics: Ruger No. 1, Number 1, #1 rifle, 6mmBR, 6BR, Varmint, Shooting, Hunting, Varminter, Bullberry, Hurricane Utah, Moyers trigger, Leupold, LRT, 7mm BR, Remington.